Scrapbook Creations has a "Try this Technique" challenge in their magazine and on their website every month. The current one is called "Cut it in Half". You can see the details on page 44 of Issue #50. 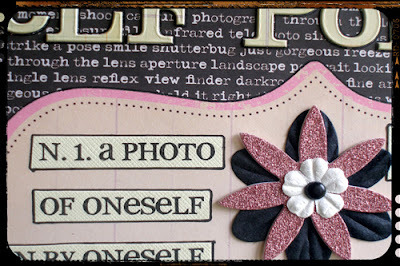 I have used Making Memories "Noteworthy" papers, chipboard alphas, and glitter jig saw pieces, (all of which are available from Scrapbook Savvy), as well as Rachel Greig paper, Daisy D's rub-ons, flowers, a brad, ink, ZIG writer, and bazzill cardstock. Wish me luck! There's a prize pack up for grabs worth $200.00 from Aussie Scrap Source! Hilarious! 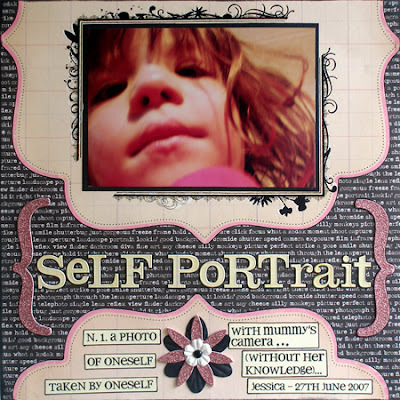 What a fantastic concept, a magnificent use of a photo with a unique twist on the scrapbooking theme! Well done yet again!!! Go you! Looks fab!! What a great use for that paper :) Good luck in the comp! your ideas are great - your creativeness is amazing !